Rekindle romance with your loved one on this breathtaking getaway far from the city crowds surrounded by just the stark beauty of nature. Book a stay at this luxury eco-resort hidden away in the scenic valley for a truly exclusive vacation experience. The resort is so so far off the beaten path that you’ll require a 4-Wheel Drive vehicle to cover the last stretch of winding mountainous paths that lead up to the resort. A challenge to cross but an extremely rewarding one, because on reaching the top you’re greeted with stunning panoramas of the surrounding valleys with a view that stretches for miles with nothing but nature beauty to admire. Weekends in Nizwa are full of fun activities and getaways. Whether you’re the adventurous type or one who likes to visit tourist destinations or cultural spots, Nizwa can overwhelm you with a huge number of superb choices. However one of the best ways to enjoy a weekend near Nizwa is in the company of family or friends and The View Oman offers the ideal location to set up your base for a perfect weekend getaway near Nizwa. The standalone cabins facing the valley offer privacy and the sprawling resort offers a plenty to do and explore with company if you don’t wish to step out of the resort itself. 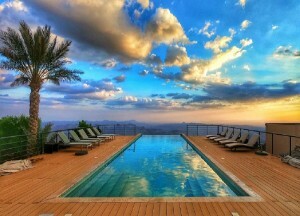 From an infinity pool overlooking the vast valley to green gardens and rocky terrain to explore. You can hunker down at the common area to play some games or read a book or enjoy an campfire with a folk performance under the starry skies. And if you feel life exploring the cultural and natural heritage of Oman you can choose from a host of destinations that are easily accessible from The View Oman including the Al Hoota Caves, Bahla Fort, Wadi Bani Auf, Ain Al Thowarah Hot Springs, Jabreen Castle, Jebel Akhdhar, the Ruins of Birkat Al Mauz, a Village Visit to Misfat al Abriyyin, exploring the Jebel Sham and much more. You can also choose to drive to Wadi Ghul the the Grand Canyon of Oman or the Nizwa Fort and Souq.Whether you love sports, sight-seeing, shopping, nature or taking your kids out during the weekend, these destinations cover them all. If you want to use the weekend to know more about the history of Nizwa, then the Nizwa Fort is a great place for sight-seeing. If you like hanging out in Souq, this fort is just a walking distance away. It showcases a museum of paintings, traditional arts, handicrafts, photos, and so much more! You can also visit the Bahla Fort or Jabreen Castle for examples of Oman's amazing heritage, culture and architecture. Visits to the town of Al Hamra and the Bait Al Safah museum there is a great way to understand the history of Omani traditions and lore. While visit to the Ruins of Birkat Al Mauz or Misfat al Abriyyin help formulate an understanding of the history of the region and the lives of the people who lived here. 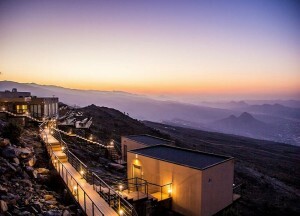 Those looking for a great time surrounded by nature should head to Wadi Bani Auf, Wadi Ghul Ain Al Thowarah Hot Springs, Jebel Akhdhar, or set out to explore the Jebel Sham. Moreover, visiting the Al Hoota caves is a unique experience in itself, expanding our understanding of the natural history of Oman and and its ecology. The more adventurous souls can set out for a guided hike or a cycling tour to discover the area in a completely unique manner. Unlike other Oman hotels we can arrange for guided or unguided hikes in to the many areas surrounding us that make for fantastic outing with a range of different trails for all ages and fitness levels from beginners to advanced. 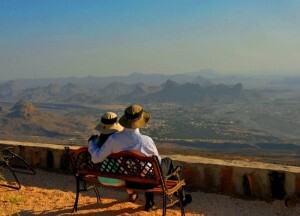 Getaways just can’t get any better, so come enjoy an unforgettable weekend getaway from Nizwa at The View Oman. We’ll help you plan everything from from the first moment to the last one to ensure that you have a fantastic time during your stay with us. There is nothing quite like sitting in an infinity pool, with a cool drink in hand, and a spectacular view spread out before you, and the sun pouring down on everything in sight. We adore the beach, but sometimes it’s a nice change to lie back in an infinity pool and just feel like you’re floating in the middle of nowhere. It’s got all the perks of relaxation and being out in the sunshine, but none of the drags of having sand all over you once you get out and that salty ocean feeling that isn’t for everyone.